Do you understand it? Do you have questions? Would you like to know whats changed? Another 20 subjects moved to the 9 – 1 grading in the academic year beginning September 2016. The first set of results for these subjects will be August 2018. It is likely that this will cover all subjects that most students will take this year. There are some other subjects that change next year – but these are in marginal subjects. The changes to grades only apply to England. Wales and Northern Ireland are not taking the 9 – 1 grading system, even though they too have undertaken extensive reform of the GCSEs in other ways. Students in Scotland do not take part in GCSEs and therefore are not impacted by these changes. In the new grading system 9 is the highest grade and 1 is the lowest grade. There will be fewer Grade 9 students than there were A* students, to signal the higher standard required to aspire to this higher grade. Some experts have said that there will be as few as 2 or 3 students capable of getting all grade 9s in the whole of England. Grade 1 is equivalent to Grade G but G – D grades are covered by the standards set in Grades 1 – 3 of the new system. Grade 5 is considered a strong pass and Grade 4 a standard pass – and so equivalent to a C grade. For the time being, Grade 4 in English and Maths is considered adequate for progression on to Level 3 study – or A level equivalent. There is an expectation that this standard with move to Grade 5 sometime in the future, as there is a genuine desire in workplaces for stronger literacy and numeracy skills in particular. In the first year, the examination boards have promised that the same number of students will receive a Grade 4 as received a Grade C. It is also going to be guaranteed that the same proportion of pupils achieving a Grade 7 or above will equal those getting Grade A or above. However, the Department for Education are clear that there is no comparison of standard between the old and new grades and this is only for the first year of the new GCSEs. Still, you might find this a confusing message – even if it is reassuring. You may be wondering what the point of all this change is and how it helps anyone. You may also wonder why 9 is the highest, especially if you took O-levels and 1 was the best. All in all, you may think that this has been designed for maximum confusion for all. Well, the official reason for the change in grading is signal that there is a new approach to GCSEs and therefore this is a new and improved system. Every subject has changed in some way – almost all moving towards 100% examination and include more vigorous subject knowledge. Another thought is that employers and colleges needed help in working out the ability of students. To put this into plain speak: there were too many students gaining A* grades and far too many achieving a C grade or higher. No big surprise really – as the government has been pressuring schools to increase these markers for many years – and schools have been particularly successful. However, this made it difficult for employers and colleges to work out who were the best students. Therefore, the new grading system is intended to toughen standards and make it clear the hierarchy of ability between young people. There are competing theories as to why it has moved to 1 – 9 with 9 being the highest. The most common idea is that it allows the flexibility to add a Grade 10, should schools and colleges become too successful at achieving Grade 9. Another theory is that it is different to the old style means of grading O-Level, therefore no direct comparisons can be made. The government didn’t want grandparents looking at what it takes to getting a grade now and saying it was harder or easier in their day. 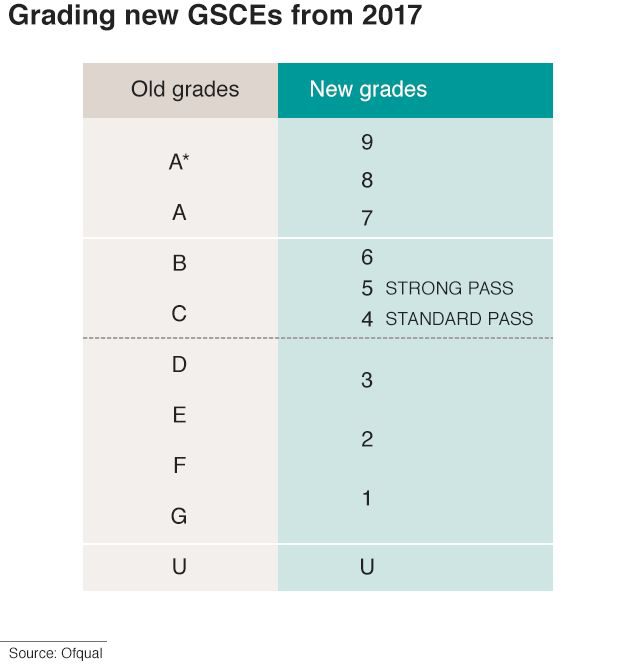 In fact, there are a lot of changes to the GCSEs and the grading system is just one of these changes. This new system is an attempt to make course content, examinations and outcome more difficult. There are topics that are assessed in GCSE maths that was once assessed at A-level. There is more content covered in History and English and many others. Whether it is fair that the GCSEs suddenly become difficult is in some ways a moot point – as it has happened, and it is the same for everyone – but it is likely to be disconcerting to your child – and they will start the courses with a sense of injustice. Also, in the past, there have been chances for resits time and time again – which led to constant testing for students. Now, there will only be a single sitting each year for examinations – this is in the May/June examination window. The exception to this is English Language and Maths, where there will still be a November resit, but this is for students who move to FE college with a Grade 3 or below and must continue trying to gain the basic pass until they are 18 years old. Schools have been discouraged from moving examinations to Year 10, which is the only option they have for early entry. This is discouraged by the rule that students can only sit the examination once in each academic year. Schools are also judged differently now. Before schools were judged on the number of students who passed at Grade C or above. There was some investigation by Ofsted and schools into progress – but this was secondary to the main statistic of A*-C pass. Now the emphasis is on progress. Now, your child goes into secondary schools with a baseline set by the primary schools in KS2 SATs. The secondary school is then required to take this student at least 3 levels higher than this baseline to be successful. The main statistic for a school is now Progress 8. This means that 8 subjects will be taken as an average of the number of levels of progress the student has made. English and Maths are counted as twice as important in this calculation – but you do not need to know the over complex formula that makes this possible – just know that this is the case. This means your school will be obsessed with outcomes in core subjects. This change to a focus on progress is good for all students who struggle at school at any level, as they will get the intervention needed. Under the previous system there was a lot of emphasis on students sat on a D grade who need to be moved to a C grade. Other students were not ignored but maybe did not gain access to the additional support that would accelerate their achievement – this was particularly true for particularly bright students who could easily get a B but could easily aspire to an A* with additionally help. Schools are still judged to some extent on the number of students who achieve a Grade 4 – as this is the boundary to Level 3 study (A Level BTEC and others). GCSE Combined Science is the new name for what was known as Core and Additional Science and is worth two GCSEs. It still covers all the sciences, Biology, Chemistry and Physics – but not in as much depth. This is the equivalent of Double Science, which is what schools used to call it. The student ends up with 2 GCSEs at the same grade in Science, when completing Combined Science. The alternative is to take each GCSE science separately, which is considerably harder. This requires students to take 9 science examinations in May/ June, as opposed to the 6 that are taken in Combined Science. This is what used to be call triple science and is usually reserved for the top 10% of scientists in a school. The important point to remember is that the system is the same for all students taking examinations this year and all schools and centres of education have had the same amount of time to prepare. Therefore, the conditions for assessment are the same for all and therefore no one is disadvantaged. At least this is the official line from the government – and in some respects it is true – as long as all colleges and employers understand the new system on a equal level too. There is some concern that students who took the previous specification had an easier time than those who took the new examinations. The standard has got harder – this has been well-publicised. Also, it is unlikely that any student will achieve all Grade 9s – as they may have got all A* in the past. Some students may see this as unfair and maybe rightly so – although they will arguably get a better education thanks to the increase in standards. Examination boards promise that the number of students achieving a Grade 4, equivalent to a C, will be kept similar. This sets the point of comparison for all future numbers of students to achieve the grade in the future. However, it does not guarantee that the numbers achieving Grade 4 won’t drop. Another perspective to consider is that workplaces will consider the new GCSE grades to be more valuable than the grades that went before. It is well-published that students have had to work harder, know more, do better under this new system. Therefore, although there may be some unfairness in the need to do more for an equivalent grade, the reward for this is greater respect for a Grade 4 and 5 then Grade C and B by employers. So, it may be that those who walked away with an “easy” C have suffered more injustice than current students. Are schools ready for this? The truthful answer is: mostly. Teachers have known that this change has been coming for a while and been sent much material from government and school leaders to research the change. Examination boards offer many free events for teachers and consultants come into schools to help teams of teachers with the transition. It is likely that many hours of training and meeting time has been devoted to this major change – and it has been talked about in some depth. However, there will remain some uncertainty what the new grades mean until students have been taken through the new examination system two or three times. Teachers will continue to compare across to the previous gradings because this is what they knew. This means that the first and second year will feel confusing for all – but this should work itself out over time. What if something happens around the time of the examination? With all the emphasis on the end of Year 11 examinations, this makes students vulnerable to the normal ups and downs of life that happen to all of us at one point or another. This may end with students unable to attend examinations or their ability to cope limited. If this happens then the examination officer at your school or college can apply for “special consideration”. If absent the marks will be taken from other examinations in the same subject and compared to the national average. This has been proven by statistics to be the fairest way to grade students in this situation. If the student attends the examination but there are circumstances that severely impacted on performance then there is room for an addition of a small percentage of marks, which should counter some of the impact on results. How are fair and consistent grades achieved by varying exam boards? There are five major examination boards in England, Wales and Northern Ireland. AQA, Edexcel, Eduqas (which used to be known as WJEC), CCEA and OCR. In Scotland, there is one examination board, the SQA. There is always concern that not all exam boards are equal – even though all are governed by the same national standards board. If you chat informally to teachers there is some belief that some examination boards are more generous than others. However, Ofqual, the organisation that monitors standards, works to monitor the work of examination boards and ensure that grades are far and consistent for all. So, it should make no difference which of the examination board is used. It is likely that the teacher has more success with certain content or question approach – rather than it being easier or harder to get a grade. Some examination boards do make the style of questions more predictable and therefore it is easier to prepare students. The awarding process used by each examination board is the same. This process decides what raw mark (number of questions marked correctly) links to what grade. This can change from one year to the next year to ensure that the content on the paper, which may have proved more challenging than expected, does not disadvantage students. It also makes sure that differences in ability profiles of students for a year group does not send the mark required too high or too low. There is a meeting of the lead examiners for the subject. The examiners view examination papers at different marks close to where statistics and the Principal Examiner suggest the boundaries should be. There is then a discussion of standard and a comparison to the statement for the grade set out by Ofqual. Higher tier students can gain grades between 4 and 9. Foundation tier students can gain grades between 1 and 5. The idea of tiered examinations is to provide students with an opportunity to succeed no matter the ability. It is only available if one exam paper does not give all students the opportunity to show their knowledge and abilities. In English, there are no tiers, as it is felt that a single tier is adequate to award all the grades. In Maths and Science, where different topics are addressed at higher grades, then two different tiers with different examination papers is appropriate. The entry requirements for sixth form colleges varies from centre to centre. The general advice is that six GCSEs at Grade 4 or above is the expected minimum standard. Some colleges will accept 5 GCSES, especially if the GCSEs are in the subjects that students wish to study and include English and Maths. It is uncertain if English Literature will be taken in placement of English Language. Some top sixth form colleges are giving offers in terms of average result. They will ask students to calculate the average grade of the top 6 GCSEs they have taken. It is likely that the more prestigious the college and competitive the entry, the higher this average will need to be – possibly somewhere between 6 and 8 – depending on the courses applied for. Wolverhampton Girls’ School, for instance, requires an average grade 6 for entry to their 6th form. They ask for Grade 6 in English and Maths and in the subjects to be studied. Grades are called 9 – 1 and not A* - G.
Gaining a Grade 9 is the exception and Grade 7 is considered an A grade or above. This is fair to students because the changes apply to all students and in Wales and Northern Ireland the changes in standard will be reflected in the number of students gaining traditional lettered grades. Schools have had lots of time to prepare. Therefore, students will not be disadvantaged and may find that employers and colleges respect their achievements more.